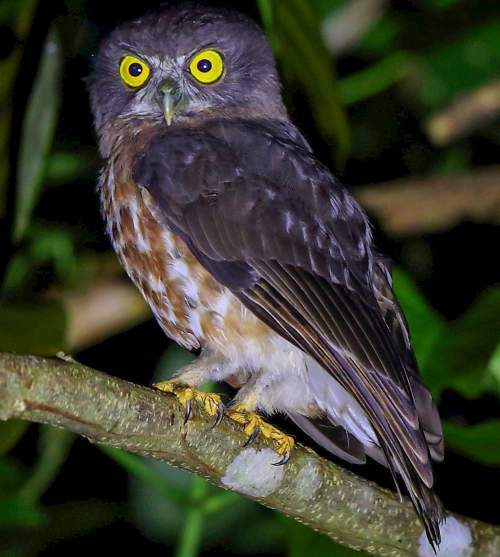 The Andaman hawk-owl (Ninox affinis), also known as Andaman boobook, belongs to the family Strigidae. This hawk-owl species is endemic to the Andaman Islands of India. Earlier, these hawk-owl species were listed as 'Near Threatened' and in 2017 were upgraded to 'Least Concern' status by the IUCN. These hawk-owls are monotypic species. The Andaman hawk-owl (Ninox affinis) is a small-sized hawk-owl, measuring 20 to 30 cm in length. There is no record of body mass. The Andaman hawk-owl has ash-gray head and nape. The facial disc is poorly defined and is grayish. The rictal bristles surrounding the bill are whitish. The upperparts are ashy brown. The scapulars have rufous bars. The tail is comparatively long and there are five caudal bands. The underparts are pale buff with long chestnut-brown vertical stripes. The abdominal feather is dark brown in the center, then bright reddish brown and whitish on the edges. The undertail coverts are dirty white. The bill is curved and is yellowish-horn. The irises are bright yellow. The tarsi are feathered to the base of the toes. The toes are bare and yellowish. The talons are blackish. The call of these hawk-owl species is a series of hollow, guttural "crauu..crauu..crauu" sound. These Andaman hawk-owl are endemic to the Andaman Islands of India. Some of the the Important Bird and Biodiversity Areas (IBA) of these hawk-owl species are Austin Strait, Barangtang - Rafters Creek, Saddle Peak National Park, Rani Jhansi Marine National Park, North and South Sentinel, Mount Harriet National Park and Little Andaman. 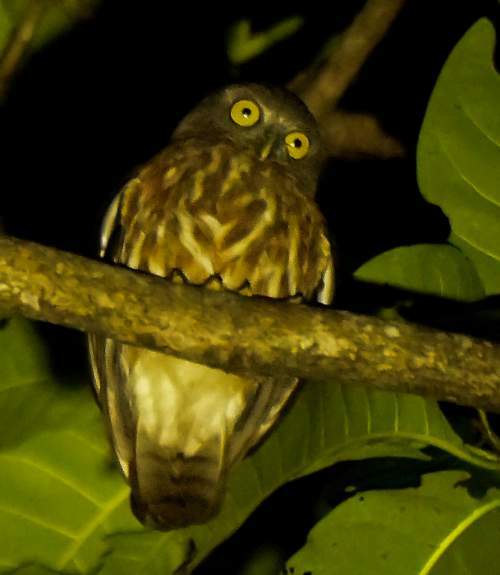 These Andaman hawk-owl species have moderate forest dependence. They normally occur in altitudes from 0 to 100 meters. The artificial ecosystems and habitats of these species include heavily degraded tropical and subtropical forests and plantations. The natural ecosystems and habitats of these hawk-owl species include, tropical and subtropical moist lowland forests, lowland secondary forests and mangrove forests. The diet of this hawk-owl consists mainly of insects. They have been observed hawking flying moths and beetles at dusk. There is no published information on reproduction and breeding habits of these hawk-owl species. These Andaman hawk-owl species are non-migrant resident birds. They disperse locally after breeding. The global population size of the Andaman hawk-owl (Ninox affinis) is estimated to number about 2,500 to 9,999 mature individual birds. The overall population trend of the species is considered to be decreasing. In most of its range, this hawk-owl species is reported to be common to rare. The generation length is 4.1 years. Its distribution size is about 15,700 sq.km. Habitat alteration and destruction and capture of adults and juveniles for pet-trade are the main threats that are endangering the survival of these hawk-owl species. The Andaman hawk-owl (Ninox affinis) does not approach the thresholds for being Vulnerable, either under the range size criterion, or under the population trend criterion or under the population size criterion. The IUCN (International Union for Conservation of Nature) has categorized and evaluated the hawk-owl species in 2017 and has listed it as of "Least Concern". Earlier it was listed as 'Near Threatened'. The CITES (Convention on International Trade in Endangered Species of Wild Fauna and Flora) status is ‘Not Evaluated’ for the Andaman hawk-owl (Ninox affinis). The Andaman hawk-owl (Ninox affinis) is closely related to the brown hawk-owl (Ninox scutulata). 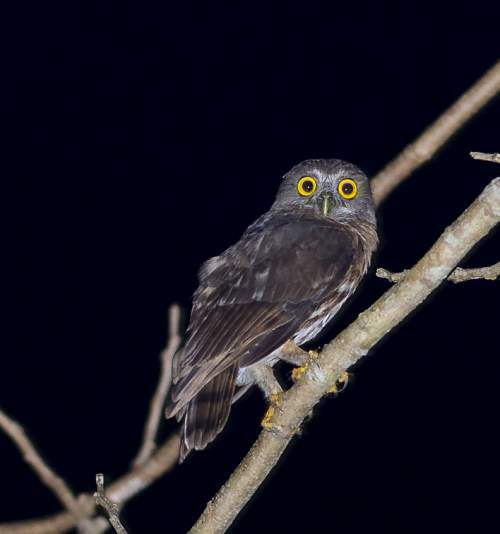 Current topic in Birds of India: Andaman hawk-owl (boobook) - Ninox affinis.